We are still sitting a hotel room waiting for the lights to go on. It's been six days since we left home to evacuate from Hurricane Isaac. The red lines on the map are areas that are without power. I have been reading stories online about Entergy with their trucks and crews sitting in parking lots not working. 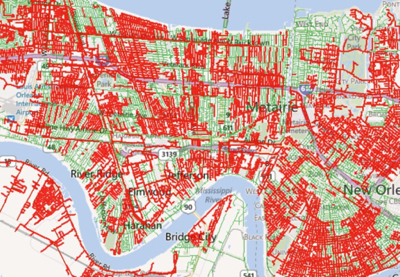 I in turn have to remember that the storm took days to pass over New Orleans. It's going to take time to restore power to a 395,000 people. On the map I can see that half of our street has power and the half we live on is out. I am praying more power is restored today. Thinking about going home is easy. Getting there won't be. When it's time we can't take the same route home. The expressway by LaPlace and going over the swamps is under water. We have an alternative route. It will just take longer to get there. We've learned from past storms going home to early will be hard. Gas and food supplies are low. It is spooky going shopping with bare shelves and the only things left are things people don't want to eat if they can help it. I'll have a mess to clean up when we get home. I gave away the food in my freezer. Everything inside of the refrigerator will have be thrown away. No telling what is growing inside after 6 days with no electric. I had to poke that picture out of my mind's eye! My only saving grace is after Katrina I only buy enough food for a couple of days at a time. We are good for a couple more days after that we have to head home with or without power. The funds aren't available to stay for more than a week. Keep Louisiana in your prayers. It's a long road to recovery. <> I know. Been there, done that. Wish I could do something, but I know no one can. Only time fixes things there, but I can think healing thoughts and send you hugs to try to lift your spirits. Thanks Mary I will take that hug. My spirit could use some lifting today. I wish you the very best and a refrigerator that won't be nearly as bad as you expect. We were gone for 13 days during Ivan and my refrigerator wasn't even stinky! The vegetables sort of desiccated and everything else was contained within jars. Thanks Susan we are hoping the same. Bev - I've been thinking about you so much. I was hoping you would evacuate. I'm so glad you are safe. I also hope going back home will be an easy trip. I hope that you are able to go home soon and that it won't be too long before the power is on and things get "back to normal". I can't imagine how hard this must be for you and everyone who has been affected, especially those who have lost everything. Safe travels home and hope you don't have too much of a mess to clean up. I will be keeping good thoughts for you. I'm so sorry you're having to go through this. Was flying an option, cuz if there is a next time I say you fly here, free place to stay and lots of beads to play with! Marica that sounds like a bit of heaven. Thanks!